Two state-of-the art studios, both with full size one-way mirrors, in the very centre of Bristol. Easy parking and access to Temple Meads train station. Technologically advanced, informal and formal spaces for creativity, discussion, brainstorming, usability testing and conferencing. Ample client viewing and larger group sizes plus quantitative hall tests if needed. Friendly, professional staff. Excellent food. Digital audio and HD visual recordings at the end of your sessions. Remote viewing via online streaming and / or Focus Vision. First rate recruitment: back-checked and cross-checked against a past attendance database. In addition: note-taking, transcription, moderation, report writing and simultaneous translation. In the very centre of Bristol. Easy parking and access to Temple Meads train station. 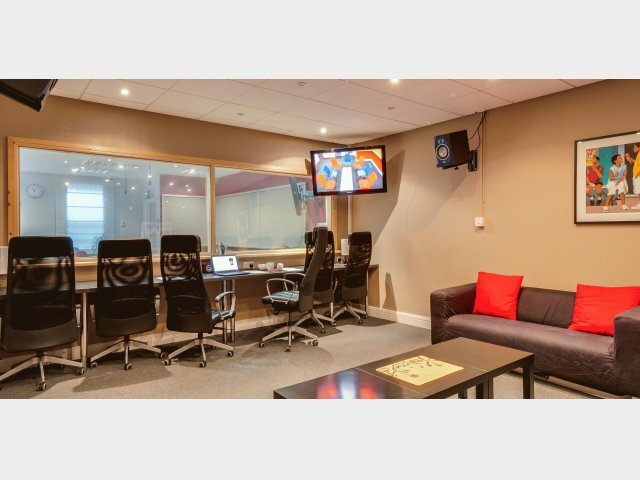 Fully-trained staff will be on hand to assist you with operation of any of the studio equipment. First Sight Studios Limited has been a member of the VFA since 2010 and is authorised to display the VFA logo. When contacting this viewing facility, please mention that you found them on the Viewing Facilities Association website. • Very friendly and helpful. Will do everything in their power to make it a successful experience. • Always very amenable, helpful and makes things run smoothly. The rooms are always well presented. • Would recommend this facility to moderators and clients alike. • Top class facility and staff that go above and beyond the level of service you would normally expect. Can't wait to use them again. • Overall a fantastic facility with very helpful and friendly staff.